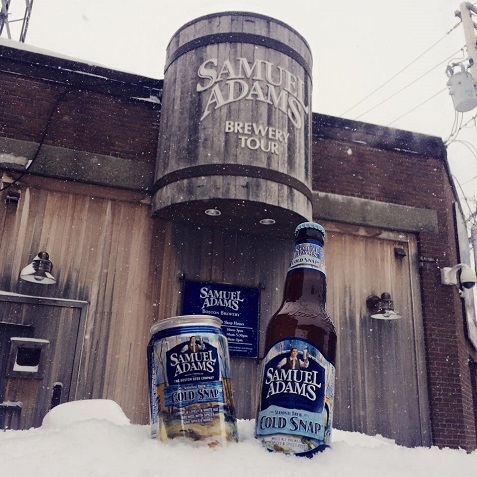 Cold Snap is the latest beer creation from Samuel Adams we tried, and the name pretty much says it all. It’s an unfiltered White Ale with a smooth wheat taste brightened up with some spring spices. There’s a subtle hint of sweet orange peel and plum along with a hint of pepper. It’s a very smooth and very refreshing drink that should go well with any Super Bowl spread this weekend. Will Gronk rule on Sunday? One of the dumbest things I’ve heard in sports was said several years ago. The New England Patriots were rolling to another inevitable Super Bowl appearance as Tom Brady was carving up defenses. Then Rob Gronkowski got hurt, and people naturally wondered what impact that would have on the Patriots offense. I was stunned at the time when many so-called experts said the Patriots could easily overcome that loss and continue to dominate. Of course the opposite happened and the Patriots were on their couches for the Super Bowl. Here’s slender model Morgan showing off her impressive cleavage with her jacket unzipped. Stephen Curry and John Wall had a heated Twitter exchange over the weekend, leading to a showdown on Saturday, February 14th, during NBA All-Star Practice where Curry and Wall will go shot-for-shot in the Degree Battle of the Game Changers. We spoke to Steph about his career, how to shoot 90% from the free throw line and how to impress babes by slathering your entire body in Degree DrySpray. Fans will help play a role in determining who is crowned the Ultimate Game Changer by voting on one of the shots the two All-Stars will attempt in the battle. Starting Monday, February 9 fans can vote at Twitter.com/DegreeMen. While Curry and Wall are sinking shots on the court, they’ll be protected by the new game changing Degree Dry Spray Antiperspirant, the new way to get superior protection. It goes on instantly dry for a cleaner feel without visible residue. Using the Degree signature MOTIONSENSE Technology, Dry Spray provides the superior 48-hour odor and wetness protection that these competitors will need throughout NBA All-Star Weekend. Will the World of Warcraft movie lead the way for more movies to be based on games? With the long-awaited film Warcraft slated for release in 2016, the future is looking bright for movies inspired by video games. Warcraft, an epic fantasy film based on the hugely popular World of Warcraft video game, will premiere in movie theaters across the US on March 11, 2016. The Legendary / Universal Pictures production is directed by Duncan Jones, based on a screenplay that he co-wrote with Charles Leavitt, who first joined the project in 2013 after Sam Raimi pulled out. British-born Jones is best known for previous big screen successes Moon and Source Code, while seasoned scriptwriter Leavitt is also no stranger to Hollywood. With a cast that includes Vikings heart-throb Travis Fimmel and action babe Paula Patton, together with a complex plot that concentrates on the World of Warcraft’s initial encounters between the humans and the Orcs, all the signs are there that this film will achieve a similar success to 2014’s Need for Speed, another game converted into a film that – despite fairly negative reviews – went on to earn $203.3 million in box office revenue worldwide.